Highland is proud to be involved with The Mad Housers, a local community organization that builds shelters for homeless individuals and families in the Atlanta area. We sat down with Peter Richards, a volunteer for the Mad Housers, to find out a little more about the group. HW: Can you give some history of the Mad Housers, how it came to be, when it started and who was responsible for its creation? Has the organization evolved since its beginnings? PR: The best source of information on Mad Houser history is the website: madhousers.org. Take a look! What I understand is that it was started by architecture students at Georgia Tech in the 1970’s or so. Yes, it has evolved. 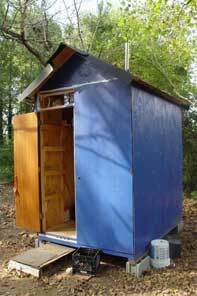 The original huts were 8′ x’6′ (and most still are) but we now have a High Hat: with more room in the overhead loft and The Lowrider: a 4′ x 4′ x’8′ hut for use in more sensitive spots (it’s lower and thus less able to be seen). Lowriders come with a 4′ cube for storage and a front deck. We now insulate the huts and have developed a more efficient way to build them and to manufacture the little wood stoves for them. We seem to get more organized every year. HW: How did you personally get involved in the Mad Housers? I read an article about them in Creative Loafing about 12 years ago. HW: Had you done much building/construction work before joining? Yes, I had build several small houses: playhouses, a workshop, an outhouse and over 100 classroom lofts. Also, I had worked with contractors in Maine for several years. HW: What age range do you generally see among the volunteers? Generally 20’s and 30’s, but you’ll see all ages among our volunteers. HW: What tools and materials do you use to build the shelters? Hammers, measuring tapes, screw gun, chopsaw, circular saw. The huts are made of plywood and studs. Roll roofing, stiff foam insulation in the walls. We use recycled doors and can always use more: we can’t use hollow-core or ones with thin panels or windows. There is one small window over the doorway for light. We don’t put in more windows because we want these huts to be as secure and safe as they can be. The huts sit on cinderblocks. The standard hut is 6’x 8′ with a 6′ x 6′ loft. HW: How can someone reading this article get involved with the Mad Housers? You can just show up to any event and you are automatically an official volunteer. Check out the calendar of events here. We build the hut panels on Wednesday evenings at our warehouse off Chattahoochee Ave. and erect them on Saturday or Sunday mornings. The architectural plans are on our website. Some of our huts have been around for 20+ years. We build them where there are already homeless people living. We have clusters of huts at several camps and also we have built single huts. If you are in the Atlanta area and interested in volunteering, the Mad Housers would love to have your skills! If you live elsewhere but you are interested in doing something similar in your neck of the woods, you can contact the Housers about starting another chapter and they can help with technical and training support. Morton’s Shop: Epoxy Fill March issue of Wood News is out!